Who is Jim Caldwell, candidate for Browns' head-coaching vacancy? Here is a look at the career of Jim Caldwell, candidate for the Cleveland Browns' head-coaching vacancy. The Cleveland Browns’ search committee continued their mission of finding the next full-time head coach Wednesday when they announced the organization interviewed their second candidate for the vacancy. One day after interviewing current interim coach/defensive coordinator Gregg Williams, the Browns brought in Jim Caldwell, the former coach of the Indianapolis Colts and Detroit Lions, for a formal interview and tweeted out confirmation of the meeting following its conclusion. 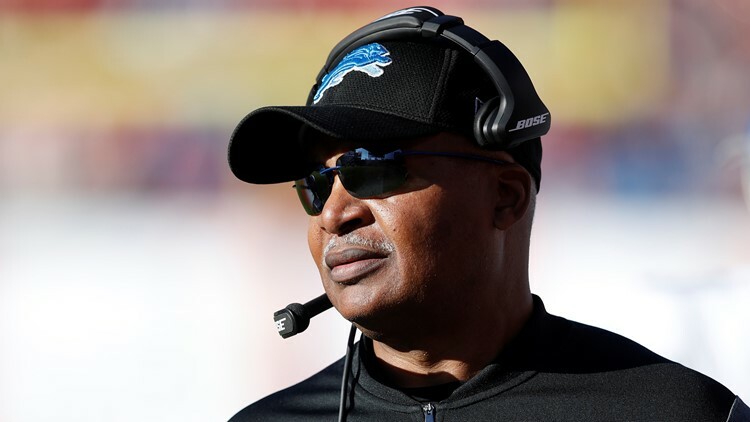 Detroit Lions coach Jim Caldwell looks on against the Tampa Bay Buccaneers in the third quarter of a game at Raymond James Stadium in Tampa, Florida on December 10, 2017. During his seven seasons with the Colts (2009-2011) and Lions (2014-2017), Caldwell compiled a 62-50 record (good enough for a .554 winning percentage). Also, Caldwell led the Colts to a pair of playoff wins and trip to Super Bowl XLIV in Miami to play the New Orleans Saints. Caldwell registered six winning seasons (2009-2010 with the Colts, 2014, 2016-2017 with the Lions), as well as three double-digit victories totals. 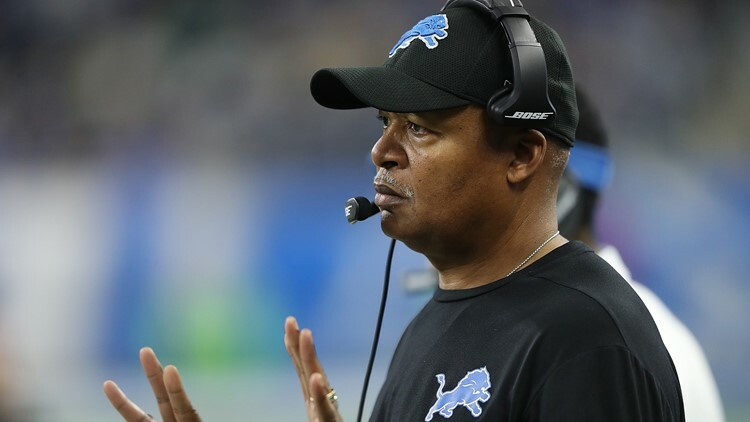 Caldwell guided the Colts to 14-2 and 10-6 records over his first two years as head coach, and then, in his first season in Detroit, led the Lions to an 11-5 record. Caldwell won two AFC South Division titles with the Colts (2009-2010) and finished second in the NFC North Division in three of his four years with the Lions (2014, 2016-2017). 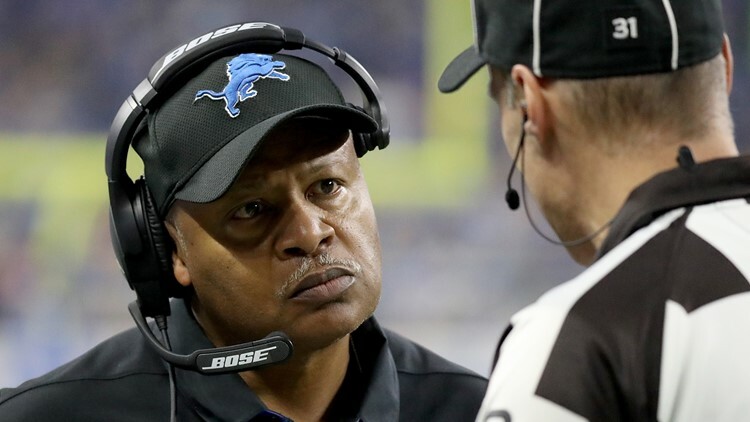 Detroit Lions coach Jim Caldwell talks with line judge Dana McKenzie during the first quarter action against the Green Bay Packers at Ford Field in Detroit, Michigan on January 1, 2017. In addition to leading the Colts to Super Bowl XLIV, Caldwell was on two other staffs to win their respective conference titles and advance to the NFL’s annual championship game. Originally a quarterbacks coach for Tony Dungy with the Tampa Bay Buccaneers in 2001, Caldwell moved with Dungy to Indianapolis ahead of the 2002 season. As a quarterbacks coach/assistant head coach, Caldwell helped lead Peyton Manning and the Colts to their Super Bowl XLI championship. That victory was Caldwell’s first, but it was not his only in the NFL’s biggest game. After his tenure with the Colts ended with his firing following a 2-14 season while the team dealt with Manning’s neck issues, Caldwell joined the staff of the Baltimore Ravens. Caldwell was Baltimore’s offensive coordinator for part of 2012 and all of 2013. Following the 2012 season, Caldwell called plays for the Ravens’ 34-31 victory over the San Francisco 49ers in Super Bowl XLVII at Mercedes-Benz Superdome in New Orleans. Detroit Lions coach Jim Caldwell watches his team against the Green Bay Packers during the first half at Ford Field in Detroit, Michigan on December 31, 2017. A native of Beloit, Wisconsin, Caldwell built up his coaching resume in the Midwest and AFC North Division. Caldwell started as a graduate assistant at the University of Iowa (1977) and continued as wide receivers coach at Southern Illinois (1978-1980), and later, an offensive assistant at Northwestern (1981). Additionally, Caldwell coached wide receivers at Louisville (1985) and quarterbacks at Penn State (1986-1992). After making the move with Dungy to help coach the Colts, Caldwell moved on to be an offensive assistant with the Ravens, and then, coach of the Lions. During Caldwell’s time in Baltimore, the Ravens had an 18-14 regular-season record with one playoff appearance and one Super Bowl Championship.